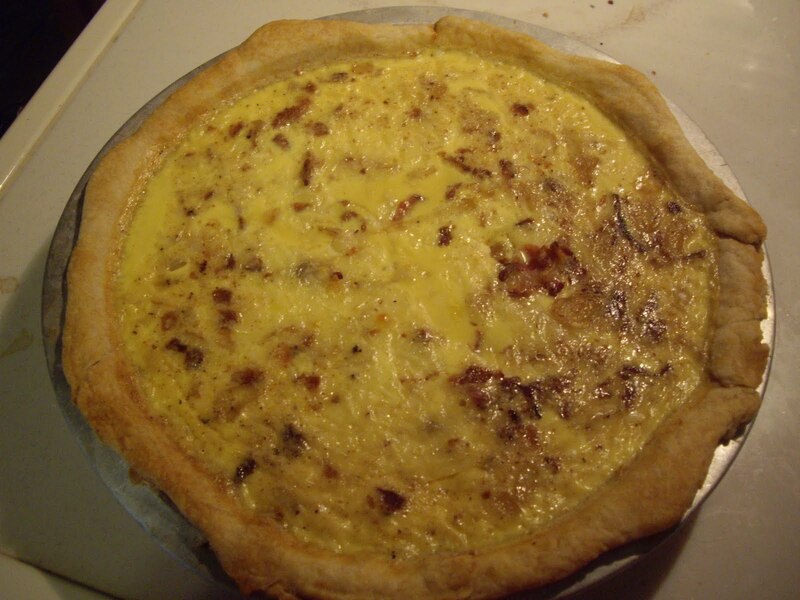 Quiche is great for brunch or even a light supper. It is pretty simple to make. Put your pie crust into a 9″ pie plate. Over the top of the crust lay a double thickness of foil. Put into preheated oven and bake for 8 minutes. Bake the crust 4-5 more minutes until crust is set and dry. If you hear moisture coming from the crust it is not done. Remove from the oven and reduce oven temperature to 325 degrees. While the crust is baking, cook the bacon until crisp. Drain, but leave about 2 tablespoons bacon drippings in pan. Cook the onion in the bacon drippings until tender. Takes about 5 minutes. Add to the crumbled bacon. In a mixing bowl, beat the eggs, milk, salt, and nutmeg. In a separate bowl, toss the flour and cheese together. Add that to the egg mixture. Pour the egg mixture carefully into the hot baked pastry. Bake for 35-40 minutes or til a knife inserted near the center comes out clean. A couple things to remember- DO NOT prick the crust with a fork. Also the creamer the Swiss cheese, the creamier the resulting quiche will be.